A conventional turbofan is divided into high and low pressure spools, each consisting of a compressor and turbine. The low-pressure spool drives the fan and provides most of the propulsive power. The fan works best at slower speeds, while the rest of the spool - the compressors and turbines - are more efficient running at high speeds. A geared turbofan introduces a reduction gearbox (as you might have guessed) between the fan and the turbine so they both operate at optimum speed. 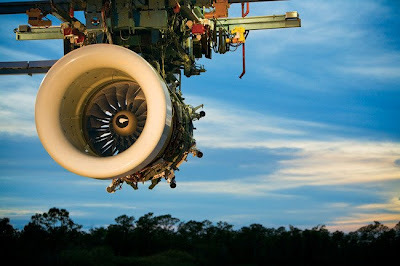 Pratt & Whitney's GTF is currently in development and it is hoped to deliver fuel savings of between 10 and 10% as well as cutting noise. The GTF is still ground testing but already has impressed some potential customers and has gained the attention of many airlines around the world.